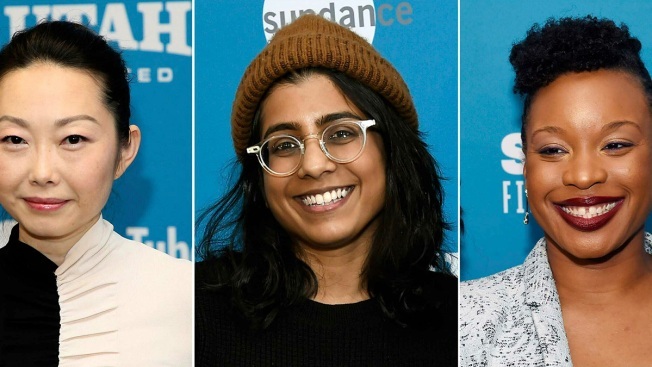 This combination photo shows directors, from left, Lulu Wang at the premiere of her film "The Farewell" during the Sundance Film Festival on Jan. 25, 2019, Minhal Baig at the premiere of her film "Hala" during the Sundance Film Festival on Jan. 26, 2019 and Chinonye Chukwu at the premiere of her film "Clemency" at the Sundance Film Festival in Park City, Utah on Jan. 27, 2019. Among the 1,200 top films of the past 12 years, female directors of color are in the single digits, with only five black females, three Asian females and one Latina, according to a study by USC Annenberg’s Inclusion Initiative. But the 2019 Sundance Film Festival is proving to be a referendum on the dismal industry statistics.